The Corolla is one of Toyota's longest running models, dating back to the late 1960's. It has built a solid reputation as a reliable compact sedan. The tenth generation Corolla has been updated to provide a logical step between the entry-level Yaris and the legendary Camry. 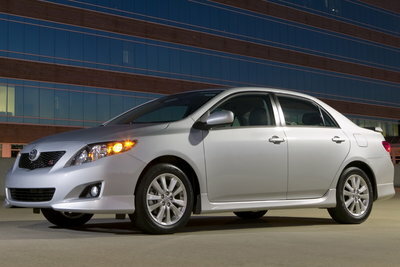 Toyota offers Corolla in Standard, LE, XLE, S, and XRS trim levels. The S and XRS models differ from the others with bodywork that is more aggressive. Two engines appear in the range. A 1.8L four cylinder rated at 27/35 mpg powers most models, whereas a higher horsepower 2.4L four cylinder is found in the XRS sport grade. The tenth generation Corolla is slightly wider and has a lower profile than the outgoing model; however, the interior is virtually identical in size. Toyota offers Corolla in Standard, LE, XLE, S, and XRS trim levels. Most models are equipped with an all-new 1.8-liter rated at 132-bhp. A 158-bhp, 2.4L four cylinder is standard on XRS models. The S and XRS also feature a standard body kit with an underbody spoiler, fog lamps, rocker moldings and a rear spoiler.